Most frequently asked question: "Why are you torturing yourselves like this?" Best question: "Where's the engine?" You may be asking yourselves why we haven't reached Africa yet. Instead of taking the direct route, avoiding hordes of European holiday-makers and crowded campsites as reasonable people would, we decided to take the long route, do some sightseeing along the way and find out what it's like to be a tourist at the height of the holiday season (not recommended!). We also thought that roads on the Atlantic coast would be flatter and the air cooler. In fact, the coast is very hilly, temperatures have been above 35 C most of the time and when the air was cooler we had to reckon with strong headwinds. We left Le Puy after a well deserved rest day and reached the busy "camping municipal" of St Almans sur Batignoles, where the fête du village was winding down and a band of gypsies was the only group of campers in sight. We were welcomed to the campground by the inebriated mayor, who couldn't be bothered to collect the fees anymore. A few hours later a retired Belgian couple turned up and accosted Amaya (with her blonde hair she obviously wasn't part of the gypsy crowd). Gypsies don't enjoy the best of reputations in Europe and the Belgians had bolted the door of their camper and were dreading nightfall. Being the politically-correct individual that she is, Amaya attempted to reassure the frightened couple: "They look like fine upstanding citizens to me." and "I'm sure they won't try to rob you in your sleep."etc. In fact they were a quiet bunch (apart from a minor brawl that broke out) and in the end we were disappointed that they didn't do anything even remotely gypsy-like such as offer to tell our fortunes or sing and dance around a roaring campfire. 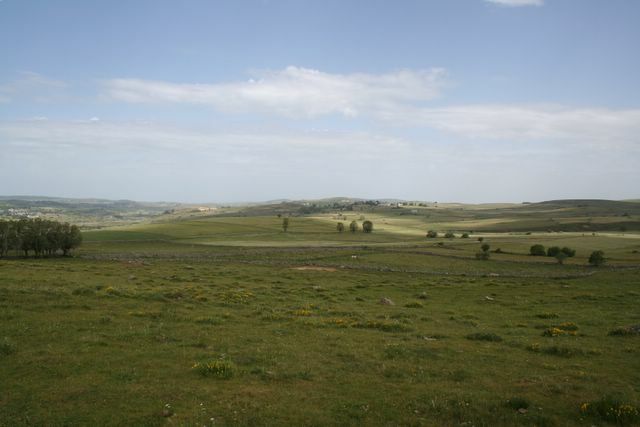 In sharp contrast to the farmlands and villages we had passed earlier, the plateau of Aubrac offered austere, windswept landscapes, limestone rock formations and highland pastures. A leg-breaking climb brought us up to the pass at 1,340 meters and then we were rewarded with 24 kilometers of downhill cruising. Such remote and desolate areas often give rise to myths and legends and Aubrac is no exception. As all good French schoolchildren know, La bête du Gévaudan, a beast half hyena, half lion terrorized the region in the 18th century and was responsible for the disappearances and deaths of numerous individuals. 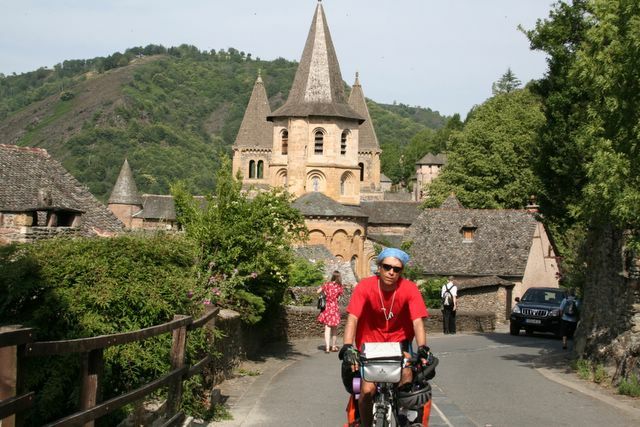 In the Midi Pyrenees, we cycled through the area that must have the highest concentration of villages voted "plus beaux villages de France". Some beautiful villages indeed, though some have long lost their "authenticity" (Conques is one of them), with most of the traditional houses turned into shops and restaurants frequented by free-spending tourists. Some villages still hold on to their spirit and charm and you have the feeling of being transported back to another era, when social life revolved around the corner café and people chatted with their neighbors instead of strangers in an on-line chat room. One fine Sunday afternoon our itinerary overlapped with that of an amateur bicycle race and we were constantly overtaken on the uphill climbs, which might have been disheartening if each cyclist hadn't had a word of encouragement and admiration as they passed. As we finally approached the top an exceptionally long climb, we were greeted with applause and invited to partake in refreshments. Cycling remains a predominately male pastime in France with only 18 of the 215 competitors being female. This figure is increasing each year we are told. 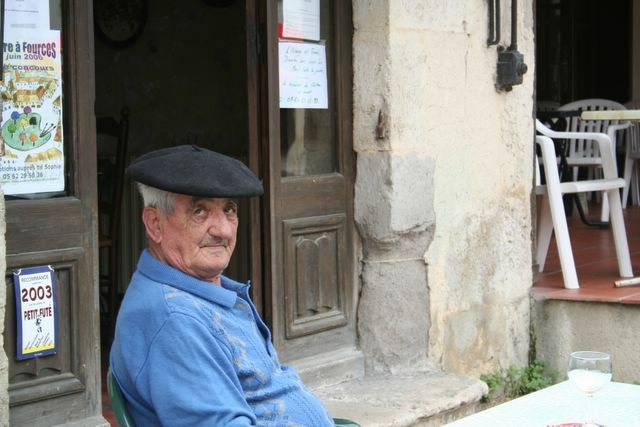 Eric had a nice chat with on of the old-timers who was ful of advice and tips for us. The five additional cycling days required to reach St Jean Pied de Port and the Spanish border became more and more strenuous, with never-ending leg-breaking ups and downs, passing through the Armagnac and Gascogne regions with another high concentration of "plus beaux villages" de France. One campsite manager told us about a couple of cyclists from the Alps who had found this terrain the hardest since they left home. This remark didn't help soothe our muscle-aches, but it was good for our morale. St Jean Pied de Port greeted us with rain and cold and we pitched the tent as it poured. Once all set up, we didn't dare venture out and huddled in our shelter and gobbled down muesli to calm the hunger as the rain fell heavier and heavier. Finally, as the storm receded we trotted down to the village, paid our two-euro registration fee, picked up a conche (shell) and officially became pilgrims on our way to Santiago to Compestela in Galicia. During the Middle Ages pilgrims from throughout Europe steadily made their way to this holy city and the route is brimming with history, legends and art. Since the mid 1980s there has been renewed interest in the 'Camino de Santiago' and today thousands of people make the more than 800 kilometer journey on foot, by bicycle or on horseback. 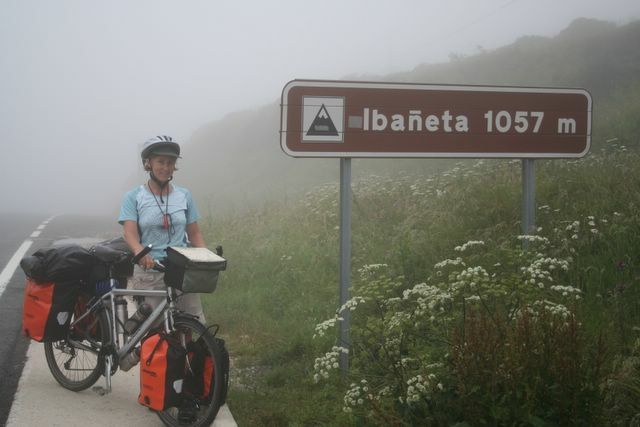 Crossing the Pyrenees to reach Pamplona was easier than we had anticipated in spite of a downpour and near zero visibility at the summit due to foggy conditions (sorry no breathtaking photos!). 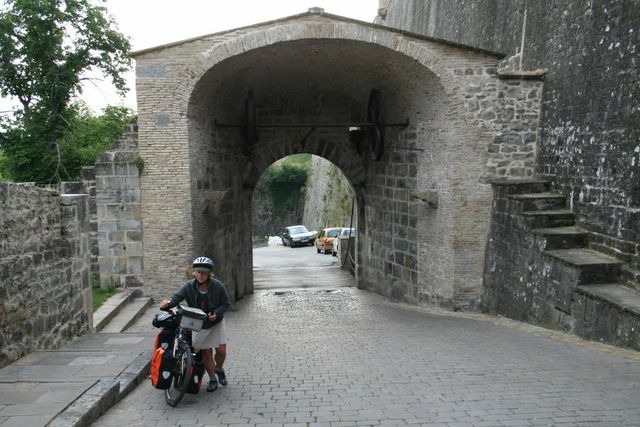 We cycled through the city gates--the very same through which the bulls pass during the famous San Fermín festival-- and wandered through the cobblestone streets of the old town admiring the Gothic architecture and taking in the ambiance of Navarra. In our new role of pilgrims, life was much easier in some respects. Firstly, to find our way we merely had to follow the ubiquitous large yellow arrows indicating the Camino. Secondly, we were entitled to stay at inexpensive pilgrims hostels. These hostels may be cheap ( 4 euros per person) but one has to cope with snorers, early risers (5 AM seems to be popular with German walkers) and plastic bag freaks who pack and repack their sacks in the wee hours when reasonable people only want to catch a bit more shut-eye. Those big, yellow arrows also led us into some trouble. Following them out of Pamplona brought us to a dry, barren stretch of land and the formidable Alto del Perdón . Well, we had to push the bikes most of the way up the ascent as the terrain consisted of man-sized holes, annoying rocks and loose gravel. 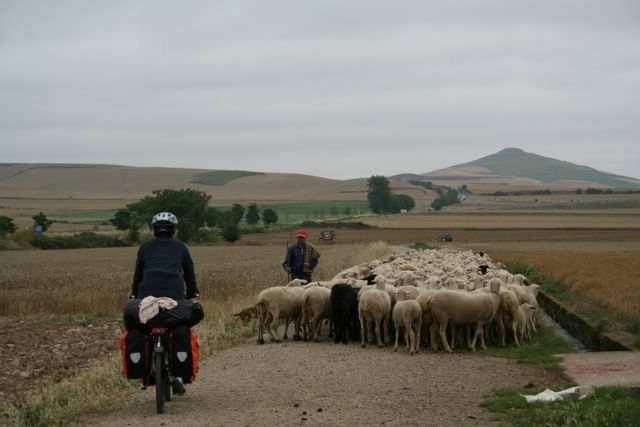 We soon discovered that doing the Camino on a fully-loaded bicycle meant finding alternative routes at times. During the 11 days we spent on the Camino we encountered diverse landscapes--vineyards and farmlands , the small peaks of the Oca mountains, the plains of León, the wheat fields of the Meseta (flatlands) and finally the lush countryside of Galicia--and diverse individuals--many who were on a spiritual search, perhaps inspired by Paolo Coelho's bestsellers, others who desired a physical challenge and also various history and art buffs. 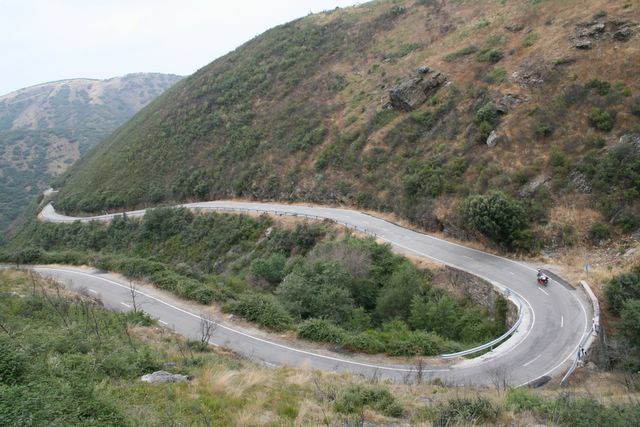 On the downside, there are also large sections of the Camino which follow the national highway and are thus noisy and nerve wracking. For a cyclist this isn't so bad as the kilometers go by rather quickly, but for the majority of the pilgrims, who are on foot, this means countless hours spent under the ruthless sun listening to the whoosh of trucks speeding by. This is when the MP3 player comes in handy. 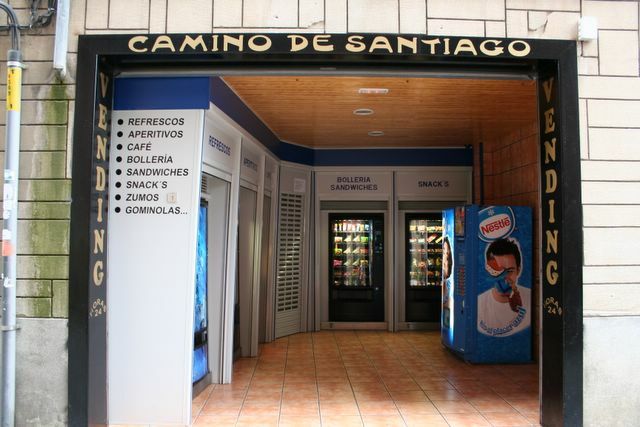 Renewed interest in the Camino de Santiago has also turned the route into a bit of a commercial circus, with Pepsi, Coca-Cola and Nestle all vying for the pilgrims' euros. Vending machines tempting thirsty trekkers are located at strategic points along the way, just before the village water fountains offering up refreshing (and free!) water. The highlight of the pilgrimage was receiving (for the 'suggested donation' of 2 euros) the Compestela, an official certificate issued by the Pilgrims Bureau in Santiago accrediting the completion of the pilgrimage. We'll be sure to have it framed to hang up with other prestigious documents and awards to impress colleagues and friends. 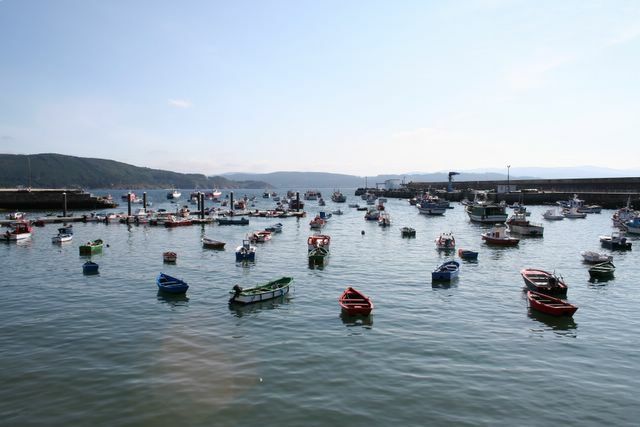 Fisterra. 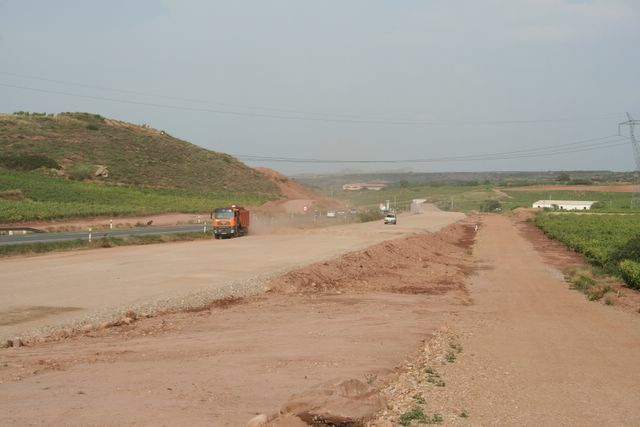 "It's not even a hundred kilometers and it'll be flat," assured Eric. He couldn't have been more wrong. An arduous six hours of cycling and a roller coaster ride through narrow winding ways finally brought us to the pilgrims hostel some 15 kilometers before the lighthouse marking the supposed most westerly point. This little side trip cost us 3 days and liters of sweat! 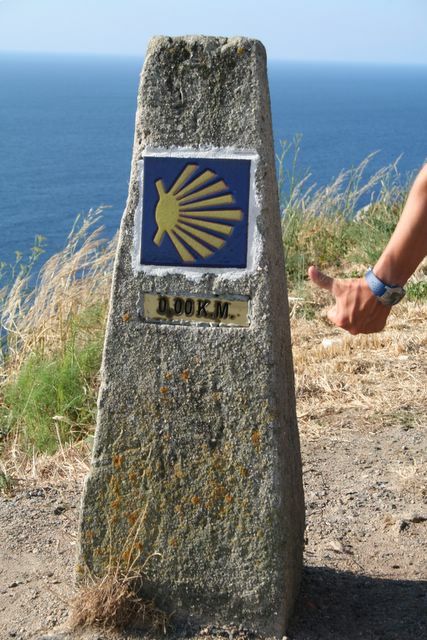 Being in a pilgrimage kind of mood, we decided to continue on the "Camino Portugues", but in the opposite direction. It was obviously not as easy to find the yellow arrows heading the wrong way and the locals were befuddled when we headed away from Santiago. "But this is not the Camino, " they insisted with a baffled look and sigh of exasperation. So we ended up riding the windy and winding Atlantic coastal roads instead. With a sense of accomplishment we finally reached the Portuguese border on the 10th of July. We expect to be on the ferry to Africa in early August, so we've still got a few more weeks of European holiday-making ahead of us. Many thanks again to all of you for your support of our fundraising efforts for CAMFED and your encouraging emails--do keep in touch!